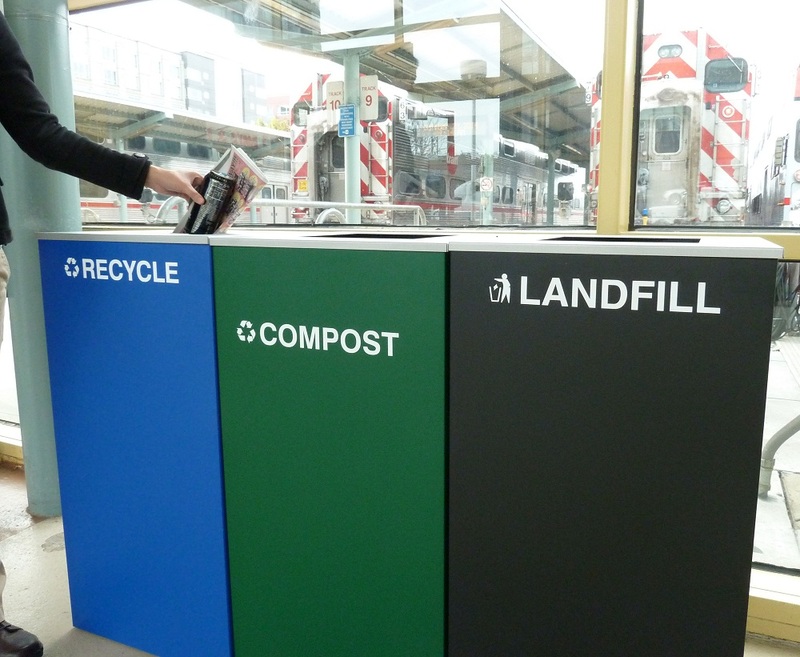 Caltrain Embraces Sustainability With Improved Waste Management Practices – Peninsula Moves! It might seem like a dirty job, but Caltrain’s renewed emphasis on streamlining its waste management practices will go a long way toward establishing a cleaner, more environmentally-sustainable agency. On October 23, all of the trash bins—used for everything from discarded food to old newspapers—at the San Francisco Caltrain Station were replaced with shiny new triple-stream recycle stations, labeled for recycling, compost and landfill. Previously, the janitorial services at the San Francisco Caltrain Station had to treat all refuse deposited in the round green bins—located near the doorways to the train platforms—as trash, creating unneeded waste. Composting bins were in short supply, and the recycle bins were colored the same as trash bins – brown. The new system will encourage customers to recycle and compost, with the upgrades being more user-friendly and with clear color coding: blue for recycling, green for compost, and black for landfill. They will be placed strategically to improve customer flow and will improve the overall appearance of the San Francisco Caltrain Station. For all stations south of the San Francisco depot, Caltrain employees will affix stickers on every trash receptacle, notifying passengers that any waste placed in the bins would be sorted off-site. The stickers are a way of letting the public know that Caltrain is committed to sustainable waste practices. Although there is just one bin for trash at those Caltrain stations, the material is eventually sorted into composting, recycling and landfill categories. In addition, the rail agency has established a new website, Caltrain Recycling, alerting customers about how trash is dealt with at stations. Caltrain has made improved waste management a top priority at the agency. Caltrain’s draft Strategic Plan includes an objective to implement and expand environmentally sustainable business practices.